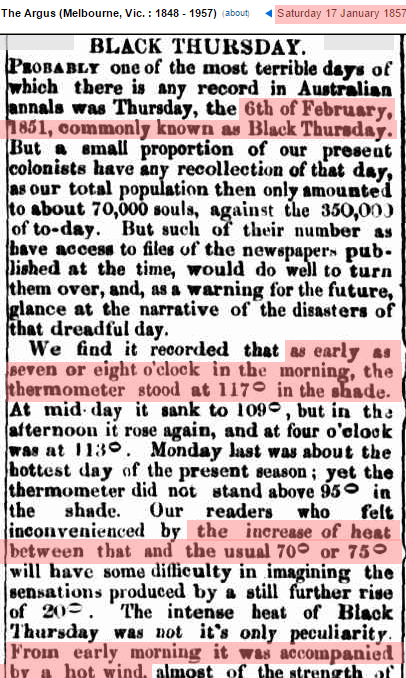 On February 6, 1851 Melbourne was 117 F at 8 AM. CO2 was at a very safe 280 PPM, and government climate criminals say that heatwaves were basically impossible with CO2 that low. Climate criminal James Hansen of NASA spread flagrant lies about this topic. Heatwaves were far more extensive prior to 1960. 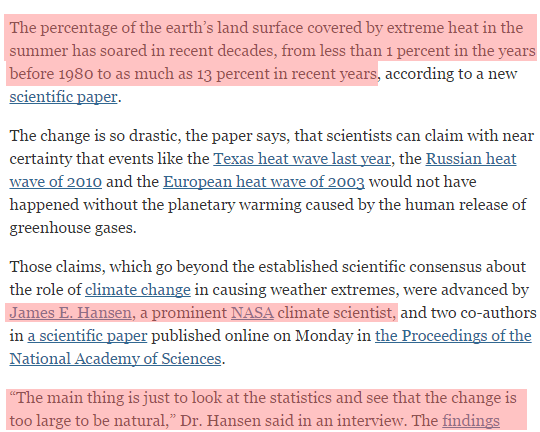 Hansen is claiming the exact opposite of the actual data, as all government climate criminals do. Just comparing the differences between James Henson and James Hansen ; one was a creative genius whom made the World a better place. The latter, is completely opposite ; a doomsayer and a con merchant to the World. Tony, mogur2013 is calling you a Fraud. When a mental Chihuahua yaps.. its funny to watch. During our so called hottest year ever, Melbourne in February 2013 reached 43 C at a UHI airport hotspot. 2014 was nothing much to look at. And the BOM keeps predicting the world will end and that we never had extreme temps before CO2 hit 350ppm. 2015 is NASA’s “hottest year ever” so they fall in line with the propaganda. And they wonder why a lot of people wanted an independent inquiry into the historical temperature adjustment scam. They even killed off a Prime Minister to protect the fraud. I mean its not like the BOM is fraudulent like Volkswagen or anything. Is it? 8am with NO Urban heat effect!!! 47.2C!!!! I’m a little moron. A little more on than you. If you meant “a little more on” crack, then, Yes, we are finally in agreement. Maybe he’s off his meds? ADHD meds can be like that..
I’ve seen similar behaviour when trying to teach low IQ, pre-pubescent teens, many years ago. Bizarre, incoherent, empty rantings. More-git’s stock in trade. Tony Heller. Please, be up front. My name is Gary Seymour. You decide to be a rocket scientist. You want to be Steven Goddard. That is cool. That is wonderful. Just be up front about it. Another jealous but empty post from the sanitary troll. What’s wrong, only one hit on your own forum the last 12 years?? Yapping Chihuahuas like you should be ignored.. or laughed at. How would I respond to your content and intelligence-free comment? You do feel sort of embarrassed for the mother, though. ! Steven Goddard was a rocket scientist? Japan considers building coal plants in poor countries to be “climate finance”, when the coal plants in question are high efficiency supercritical coal generators. Competing with China to fund the GROWTH of coal fire power in developing countries. Greenland ice mass budget trending above the 1990-2013 AGAIN so far this year. And the Arctic sea ice is climbing quite quickly . !! gees, I bet the people living up there would absolutely LUV some actually warming !! !